Properpick is a great way to advertise your marketing services to businesses. You can advertise directly from our site, creating a video marketing campaign to let potential clients know what you offer their business. Whether you service clients from San Francisco to Boston or want to target local businesses in your area to build a working relationship, we can help you advertise. Nothing shows how well you market like your own marketing strategies. Impress clients by creating a promotional business video that encourages prospective clients to click through and visit your website, look at your pictures, or view more of your videos. Our advertising campaigns are affordable and creative, giving you an edge over the competition. When a potential client makes a personal connection with you, it's much easier to convince them to hire you as their marketing service. With live chat options offered by Properpick, you can engage prospective clients and give them a feel for your personality, which helps them determine if you two will work well together. A client is more likely to choose you if they've spoken to and interacted with you over a chat session. 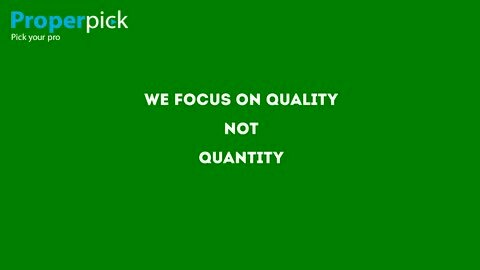 When you use Properpick, we don't tell you how advertise your business. You can connect with potential clients by customizing your marketing video production and creating a unique video that maximizes your exposure. Your profile introduces you to clients, so don't hesitate to make it eye-catching and effective at bringing in potential clients. You can use your own recording device to make a video at home and upload it to the site. You can show clients how you've effectively managed to market for other businesses and showcase why you're the marketing agency perfect for their needs.